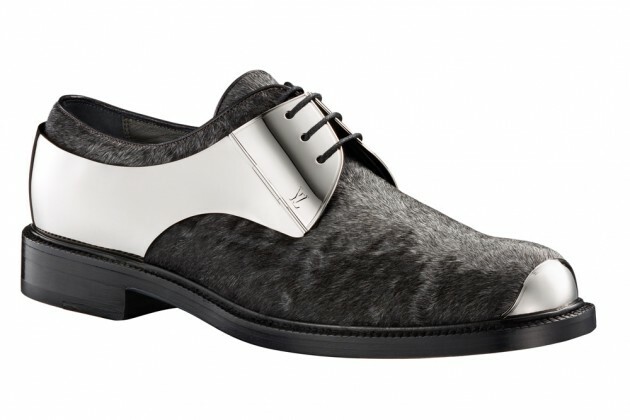 This fall men’s footwear it taking another turn. It’s all about metal detailing. Not since the seventies and eighties has this trend been mainstream for men. You find it on the heel, toe and other parts of the shoe. This trend has already picked up in women’s footwear now it’s time for men to step into this look. Metal plates have been added to the heel cups and toes which give the shoe a shape and structure. But some have small details on the side, eyelets and even entire panels of metal like in Louis Vuitton’s lace up oxford. Metal isn’t the only trend but there is also texture of fur being incorporated into the styles for this fall. A look that’s fitting for a man in a more creative realm, it’s not exactly a style one would expect to see in corporate environments. It’s for the fashion forward or man who loves the attention. Vuitton has a style combining these two trends in the latest collection. Choosing your style carefully is the key to keeping it classy instead of tacky. Too much on the shoe can make you look like you’re trying too hard to be trendy. Dark metal on toe caps on charcoal or black leather shoes are the best for men who want to embrace the look without going overboard. Like the pair made by Louis Vuitton pictured below can be worn to the office without looking over the top. Some designers included an extra strap that gives a more equestrian feel. Like Salvatore Ferragamo’s ankle boot with a belted strap. It has the metal detail at the heel with the strap coming through the metal. Whatever your personality, finding the right shoe won’t be difficult. The easiest way to upgrade a suit is simply wearing a brand new pair of shoes.